The Best UK Gaming Blogs from thousands of UK Gaming blogs on the web using search and social metrics. Subscribe to these websites because they are actively working to educate, inspire, and empower their readers with frequent updates and high-quality information. UK Gaming newsletter is a comprehensive summary of the day's most important blog posts and news articles from the best UK Gaming websites on the web, and delivered to your email inbox each morning. To subscribe, simply provide us with your email address. United Kingdom About Blog VG247 is a video game blog published in the United Kingdom, founded in February 2008 by industry veteran Patrick Garratt, to deliver all the latest best gaming info, reviews and guides around the clock. Facebook fans 374,239. Twitter followers 219,934. About Blog Rock, Paper, Shotgun provides PC games reviews, news and more with enthusiasm and personality, from some of the most experienced writers in the business. Facebook fans 97,461. Twitter followers 189,165. London About Blog VideoGamer.com is one of the largest video game websites in the UK. We provide trusted news, previews, reviews and features on all the latest and greatest games. Facebook fans 14,817. Twitter followers 46,226. United Kingdom About Blog TheSixthAxis provides European Gaming News and Opinion. Created in 2007 to focus on the PlayStation 3, the site has expanded to cover all major platforms. Its mission is to provide the most up-to-date previews, reviews, news, and gossip in TSA's own inimitable style, and to cater for our wonderful and nob-free community. Facebook fans 2,984. Twitter followers 12,547. UK About Blog We are home to a collection of the finest free HTML5 games online, mobile games, arcade games, action games, casual games, casino games, cooking games, puzzle games, etc. Facebook fans 1,055. Twitter followers 26,139. UK About Blog Developers of original downloadable PC games such as the political simulation game - Democracy, Kudos, Gratuitous Space Battles, Rock Legend, and many more games. Facebook fans 21,593. Twitter followers 10,704. About Blog AskAboutGames is a joint venture between the VSC Rating Board and games trade body Ukie, run with input and advice from across the games industry. AskAboutGames is supported by video game publishers and retailers in the UK – who are keen to ensure their products are enjoyed by suitable audiences. Facebook fans 293. Twitter followers 759. Ipswich, England About Blog Frugal Gaming is a website dedicated to saving gamers money. We tirelessly search the internet for the cheapest video game prices and discounts. Launched in 2008, we have been helping gamers keep their hobbies alive during these tough financial times for nearly 10 years. We also have a dedicated review team, forum and podcast where you can keep up to date with everything gaming related. Facebook fans 2,444. Twitter followers n/a. Facebook fans 466. Twitter followers 2,378. Facebook fans 6,610. Twitter followers 7,308. United Kingdom About Blog AbsoluteXbox provides you with all the latest Xbox reviews, news and interviews. We have forged great relationships with all Xbox developers to ensure our content is fresh and unique. Facebook fans 88. Twitter followers 333. UK About Blog Gamezplay provides daily video game news since 2006, official HD game trailers and information. Gamezplay is a blog about video games on all platforms. Facebook fans n/a. Twitter followers 503. The Upside Down About Blog We are new and slowly building up our staff and reviews on the site. We are looking to cover all current consoles and some Steam/PC Games. Ancient Gamer is a team who lives and loves playing games across all platforms and all genres. Facebook fans 46. Twitter followers 304. Wales, United Kingdom About Blog I started Rapid Reviews UK to write short, concise and informative games reviews which people can read quickly. I have been a video game and gadget fan for as long as I can remember. Facebook fans 8. Twitter followers 757. Dungannon About Blog Critical Gamer provides Gaming news that matters. It brings you only what the authors, as fellow gamers, would want to read. Manchester, England About Blog Are you a PC Gamer? Then follow me for honest, unbiased reviews with NO ADVERTS or sponsorship tomfoolery. My name is Lee and most know me in the gaming world as Genophix. I am a humble gamer from the north of England and for as long as I can remember I have enjoyed computer games across most platforms. Facebook fans n/a. Twitter followers 251. LONDON About Blog We review video games across all formats. We cover TV, movies and comics. Facebook fans 297. Twitter followers 2,440. Sheffield, UK About Blog At GameSessions we believe that one day every game will be available to try before you buy. GameSessions offers a fresh option for gamers, letting everyone download and play a wide range of games for free on their own PC. During the trial, you'll have the chance to rent or buy in-game to unlock and play on instantly. You will then be able to play the game through Steam™, without losing your trial progress. Facebook fans 6,093. Twitter followers 1,029. About Blog The independent WE/PES source, for the fans, by the fans. The blog is dedicated to informing the fans of news and updates on the upcoming versions of the Winning Eleven franchise. Facebook fans 2,192. Twitter followers 15,019. London About Blog Welcome to Gamewagon the premier provider of video gaming party entertainment, social gaming entertainment and Junior Game Creators online code club. Facebook fans 3,229. Twitter followers 731. About Blog UK game blog & Twitch stream from the XP To Level gaming house, with a team of streamers, game writers, game reviewers & blog. Made for gamers by gamers. Facebook fans 3,070. Twitter followers 762. Dover, England About Blog The PC Gaming Nerd is an avid PC gamer's website about their opinions and personal experiences with PC gaming. West Midlands, England About Blog A PC Gamers Blog Site. I have tons of content related to gaming. Follow my blogs for intresting stuff. 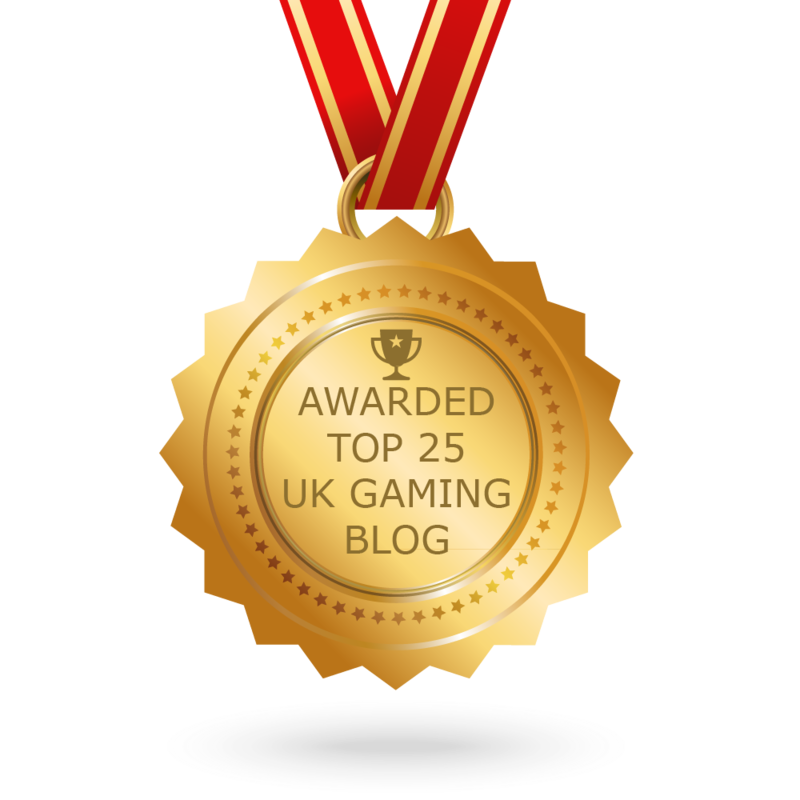 CONGRATULATIONS to every blogger that has made this Top UK Gaming Blogs list! This is the most comprehensive list of best UK Gaming blogs on the internet and I’m honoured to have you as part of this! I personally give you a high-five and want to thank you for your contribution to this world.